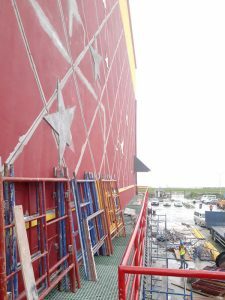 There are questions now whether materials ordered for CJIA’s expansion project ended up at MovieTowne, Turkeyen. One week after what should have been a routine press conference to talk about the progress of MovieTowne’s mega project at Turkeyen and some of its challenges, the fallout is continuing. Yesterday, Giftland’s chief executive, Roy Beepat, raised the question whether materials granted under duty free concessions for the US$150M expansion project at the Timehri airport ended up or were used at the MovieTowne project. Under concession agreements with Government, investors or foreign contractors can bring in equipment duty free, once that equipment is used for the specific project. The same goes for building materials, including lighting, cement, steel, windows, paints and other items. Any deviations are considered breaches. On Sunday, the Guyana Revenue Authority (GRA), as the body that monitors duty free concessions, admitted that equipment currently being utilised in the construction of MovieTowne, was in breach of the terms of another Investment Development Agreement (IDA). While GRA did not name CHEC as being the guilty party, it was obvious that it was CHEC that the authority was referring to. GRA was responding to allegations that it delayed the granting of concessions to MovieTowne and therefore affected the timeline of the project. Giftland opened in July 2015, spawning from a relatively small store in Water Street. It is hugely popular, but with money from local banks financing it and high overheads, the opening of parts of MovieTowne, including its movie theatres, later this year could essentially spell the death of Giftland. Beepat is insisting that he borrowed heavily and saw little benefits in terms of concessions from the past Government, except for equipment to the Caribbean Cinemas movie theatres. Beepat wants to know whether materials that came for the airport project, a Government of Guyana project involving a loan, ended up at Turkeyen. The businessman, in a Letter to the Editor (see today’s edition), said that the misuse of equipment at MovieTowne is tantamount to fraud. Beepat noted that he paid all his duties and Value Added Tax upfront. He wants to “know what fines are being levied” since it is a case of MovieTowne getting “credit on duties and Vat” while Giftland paid upfront. Giftland also wants GRA to ensure and make checks to see whether buildings materials from the airport project was not mixed in MovieTowne project. Beepat insisted that the Giftland Group is open for competition as long as the playing field remains level. On Sunday, GRA in its scathing response to MovieTowne, denied it caused the delays of the Project. Noting that construction of MovieTowne commenced in 2011, GRA disclosed that it was only in mid-2017 that the principals first met with the GRA to discuss the issue of concessions. They requested that concessions be backdated to the commencement of construction. However, the authority said it could not backdate the concessions. GRA also said it pointed out that there were breaches at the MovieTowne site, with concessions being abused. GRA said that MovieTowne submitted an IDA application to the Guyana Office for Investment (GO-Invest) and was advised in September 2017 by the GRA that only concessions similar to those granted to competitors in the industry will be allowed, and further, that additional information was needed, inclusive of source of financing, before a recommendation can be made to the Minister of Finance for approval. MovieTowne, which has several facilities in Trinidad and Tobago, is promising to take entertainment to another level, with Starbucks and IHOP, and Hard Rock Café, among the big names to come. It is promising eight cinemas with the latest technology. It was only a few weeks ago that investigators slapped fraud-related charges on former Minister of Finance, Dr. Ashni Singh, and privatization head, Winston Brassington, for the sale of the Turkeyen lands to MovieTowne, among other transactions. The lands, prosecutors are insisting, were sold below market value. MovieTowne’s principal, Derek Chin, has insisted that the lands, sold below market value, were part of the concessions for plugging in US$40M into the project. Chin is a Guyana-born businessman with interests in Trinidad and Tobago. The issue of concessions, including duty free and tax breaks, has been one for hot debate in recent years, with local businesses complaining bitterly of being sidelined with foreign investors benefiting significantly, with little evidence, grounded in figures, as to exactly what Guyana was getting in return.